Auto portability is an innovative process added to an existing plan feature. Auto portability is the routine, standardized, and automated movement of a retirement plan participant’s 401(k) savings account from their former employer’s plan to an active account in their current employer’s plan. Auto portability can be further-defined by the innovative financial technology that it embeds, including algorithms to locate, match and transfer accounts, as well as a security framework designed to protect sensitive participant information. Auto portability’s innovations are also designed to work hand-in-glove with an existing, commonly-used plan feature: the automatic rollover. Existing automatic rollover programs, while good for plan sponsors, can harm participant outcomes due to their high cashout rates, excessive fees and inappropriate investments. Auto portability addresses these flaws and can be incorporated into existing automatic rollover provisions and service arrangements, allowing for easy adoption. Auto portability is sound retirement savings public policy. Legislators, regulators and retirement researchers recognize the sound public policy represented by auto portability’s positive impact on America’s retirement system. The benefits are impressive, including minimizing unnecessary cashouts, facilitating retirement savings consolidation, preserving retirement wealth and ultimately, increasing retirement security for millions of Americans. These outcomes have a solid basis in foundational research. For example, EBRI’s Retirement Security Projection Model (RSPM) predicts that auto portability alone, when applied to balances less than $5,000, will reduce the nation’s $4.1 trillion Retirement Savings Shortfall (RSS) by $1.5 trillion. The RSPM model predicts further, significant incremental benefits when auto portability is combined with other retirement savings public policy initiatives, such as expanded access. The U.S. Department of Labor, as reflected in their recent actions. Congress, including a 2017 letter from 11 Republican Senators and a 2015 letter from 11 Democratic Senators and House Representatives. Industry centers of influence, including the Bipartisan Policy Center, the ERISA Advisory Council, the American Benefits Council, DCIAA, WISER and others. Retirement researchers, including EBRI, LIMRA’s Secure Retirement Institute and Boston Research Technologies. Auto portability is good for plans and is in the best interests of participants. For plan sponsors, auto portability is unusually beneficial, as it simultaneously acts to reduce small balance accounts, minimize missing participants and enhance plan metrics -- all while improving participant outcomes. Under auto portability, plan sponsors with automatic rollover provisions will still experience the benefits of reducing small-balance, terminated accounts, along with greatly-reduced participant cashouts. Importantly, new participants can automatically roll-in balances from their previous employers. For many plan sponsors -- particularly those who experience high rates of employee turnover – the two-way benefits of auto portability could make the difference in a decision to adopt automatic enrollment. For 5.3 million American participants changing jobs each year with balances less than $5,000, auto portability will simplify their lives and improve their retirement security. Today, these participants experience cashout rates of 55% during the first year following a job change, and those who don’t cash out can see their small-balance savings exiled to dead-end safe harbor IRAs or forgotten altogether. Following the widespread adoption of auto portability, these participants can rest easy with the knowledge that, by default, their balances left behind in a former-employer’s plan will soon follow them to their current-employer, saving them time and money, and significantly contributing to their financial well-being. 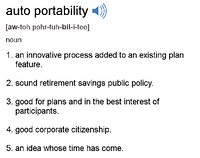 Auto portability is good corporate citizenship. As a voluntary program representing sound public policy and delivering a clear societal benefit, the adoption of auto portability can be considered as an act of corporate social responsibility, while remaining a sound business decision. Auto portability’s societal benefits apply to all small-balance job-changing participants, but these benefits tend to disproportionately favor women, minorities, younger workers and lower-income segments – all shown to experience higher levels of cashout behaviors following a job change. Auto portability is an idea whose time has come.